I’d like to suggest you take the next 6-8 weeks to sit with your real estate advisor/partner and review your 2018 operational plans. What has our 2017 experience taught us? What surprised us? What assumptions were confirmed? Confirmed This is still a seller’s market. 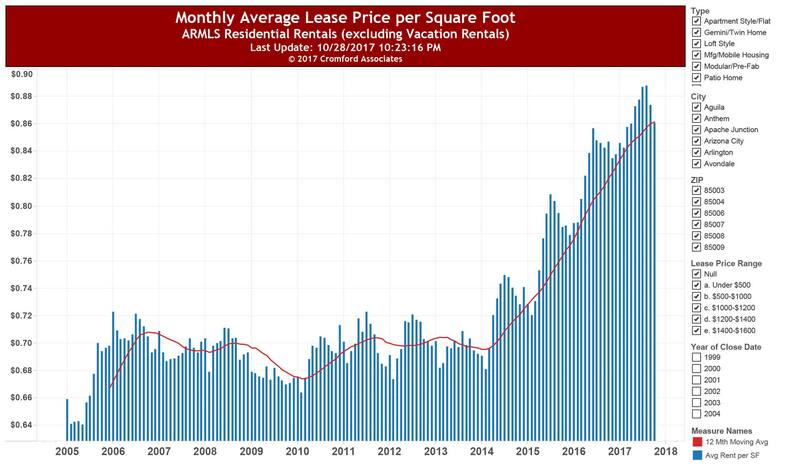 The data supports a strong 2018, with appreciation continuing while rents continue to rise (caveat here, for the past few weeks, rents have flattened, slightly. This may be a pause, or a trend, and I will continue to monitor and keep you posted). Taught us Inventory continues to shrink, and that combined with strong demand means investor buyers will need to do their homework before beginning shopping. Once you begin your search, be prepared to move with confidence and authority. I recently helped an investor friend in North Scottsdale, and we were out-bid on our first four offers. (We were offered the opportunity to raise our offer price on these first homes, but decided, based on Cromford research that the home/price deal we were looking for was appropriate and still out there. We did indeed find that deal and purchased shortly after). Surprised us Home builders are not building at the rates they were pre-bubble. They are also focused on outlying communities like Surprise, Mesa, San Tan Valley, and southern Chandler and Gilbert. Almost all their construction activity is selling ~ $300K to ~ $450K (very little entry level or high end inventory). Finally, many current home owners are choosing to hold onto their current home. These factors, create rising prices/declining inventory, and increasing rents. All this indicates very strong demand and gives the current market legs, with no slowdown in sight. I have included 2 Cromford Charts below that show home price and rental rates appreciation. Many thanks for spending a few moments with me, and as always, whether buying or selling, please make sure you partner with a licensed realtor. The data clearly shows that using a Realtor raises your selling price by ~10%. Finally, if you haven’t yet found your realtor/partner, please consider reaching out to me, I would be happy to help. Hopefully, if you’re viewing this page it’s because you are interested in, or have already started investing in Real Estate. Because I have deduced this:), I’m going to skip the basic basics and discuss which elements one should look at in order to help predict the greatest return on your real estate investment. Pick a good agent:) I know this sounds a little self-serving, but start with someone you trust who can quickly get you the “Appropriate and Accurate Data” on the market you’re interested in. If possible, start your early investing in a neighborhood you know and feel confident in. This is not necessary with a good, data grounded agent, but can help and will make you feel more comfortable. Gather the data basics. Home appreciation as expressed as” price per square foot, over time” is a great one (and required). Use a rolling 3-month average to smooth out the noise. Is the market going up, and has it been doing so? Be sensitive that all price ranges can move at different speeds, rates and directions. A $2,500,000 Scottsdale investment might (and likely will) appreciate at a different rate than 10, $250,000 townhouses. Top priced homes can exhibit stalling, or even temporary price drops, in the middle of a buying boom in the low to mid end. There is very good data available here, as well. Have your agent run the data for different price segments and discuss with you what the best performing segments are, and why. Are we beginning to see a bubble? Is appreciation growth accelerating? Is the market slowing, or stalling? What does the trend in inventory growth look like? Are there more homes than buyers (there is trend data for this), or a balance between inventory and buyers, or are we experiencing a lack of supply? Each of these probably indicates a different decision in order to grow, or protect your money. If you’re investing to then rent your property, what do the current rental rates look like? Is rental price per square foot, going up, down, or flat? Use trend data, expressed in rental price per square foot. This is a great basic predictor of what you can expect in income. Pick an agent you trust, and that is very good with data and analytics. Gather the data, appreciation trend, inventory trend, and rental rate trend. Use this data, with the help of your agent to look for best location, price point and home type to pick (and predict) which investment will likely produce the greatest ROI, and feels right for you. If you’re reading this article, you’ve already decided to get more information about investing in Real Estate. And why not, real estate is a tangible asset and a great investment. That simply means that what you get when you buy a house, unlike cash, bonds or stocks is physical asset that has great potential to appreciate. I could quote lots of stats about how real estate investing compares to a return you might get from the stock market (in fact, in another blurb on this web page, I do:), however for this article I’m going to assume we have already had that conversation and are going to talk about how to get started in Real Estate investing. Step 1 Talk with your accountant and see if they are comfortable being your real estate investment accountant also. If yes, discuss your financial goals and ask assistance in understanding how you might begin to build a plan to get there. Step 2 Find a great Real Estate agent who can help you understand the possibilities and discuss where to begin your search, which price ranges, neighborhoods and home/property types have the greatest appreciation/growth potential. Make sure your Realtor has good, data-driven knowledge of the market. This data-driven approach is what produces the highest levels of predictability. Step 3 Find a great lender you are comfortable with (I can suggest a few). Make an appointment to discuss your goals and specific investment plans, based on what you and your CPA have discussed). They can help you assess your financial investment power (how much home investment is right for me) collect the personal documents necessary to qualify with lenders, and, after you make your investment buying decision(s) shepherd your loan through the buying process, ensuring a fast, efficient buying cycle. This competence will give you, and the seller you are doing business with a great deal of confidence in you as an investor. This respect is “an edge” in your buying negotiations. That’s my recipe for success and I would be happy to meet and discuss how this can work, in person. If you need any recommendations on lenders, or CPAs (or anything else:), I can refer you to several well-respected resources. Below you will see an analysis of greater Phoenix real estate that I have tailored to a very specific price range; single family homes in the across the valley with a sales price between $275K-$300K. You may wonder why I am calling these homes “valley opportunities”. This is simply to encourage you to think a little outside the box when it comes to your real estate investing. Many of the hottest valley opportunities across all Phoenix are homes in this price range. This is due, at least in part, to the thousands of homeowners who were “trapped” in their starter homes by the Great Recession and have finally replaced their lost equity. The housing market, generally speaking, has recovered, through the year to year appreciation, to be at, or above pre-recession levels. This means that an entire group of homeowners can now sell, and buy up, and they are. Additionally, some of those recession trapped homeowners that were forced to walk away from their investments and seek financial legal protection, have come out of the mandatory 7-year credit record period. Their credit reports are clean again and they can now buy another home, and they are. This type of dual phenomena doesn’t often happen. The generation of recession, starter home people looking, and needing to move up, and the unfortunate many who temporarily damaged their ability to buy, are all looking to buy at the same time and consequently are adding thousands of buyers to the market. Many of these are looking in the $275k-$300K range. These people will drive home values up, for several years to come. Perhaps the most interesting fact about this activity is that it has not produced another bubble, simply a market that is driven by a very solid, growing demand. If you’re interested in learning more about this opportunity, please consider contacting me for a data driven consultation. In order for any investment to do well, the environment that surrounds it must be fertile. For real estate that means the economic health of the community both people and businesses must be good. It also means that the indicators that tell this story should be one of the data points the savvy investor looks at before making his or her investing decision. On my investment page, I have attempted to provide you with both the metrics, and the processes for how and why you might want to begin investing in Real Estate. You will need both the right data, and the right processes to produce the desired result; the creation of investment income for a long time to come. Let me then switch to another important dimension, time. Is this the right time to begin, or add to your Real Estate investment portfolio. After digging our way out of the 2006-2011 housing crash, we have had steady home price appreciation across the entire greater Phoenix area. Take a look at the below price/sq. ft. chart over that period of time, for greater Phoenix, all areas. We are finally back to pre-housing crisis levels, but still, have plenty of room to grow. The yearly appreciation is strong, but very measured, even and well within our “normal” appreciation rate, an indication of a healthy market, no bubble. If you are waiting for something, like a price drop, or a drop in interest rates, don’t wait too long. Home prices are up for the past several years and show no signs of dropping. Rental rates per sq. foot are also up, so if you are one of the many investors that are considering buying to create rental income, consider buying now. Locks in your payment, while your rental income increases. And interest rates are up roughly 1 point since the bottom. The rates are still historically quite low, and that’s another reason they probably won’t be dropping. So, why wait. If these trends continue, and they should if you wait you will pay more, finance at a higher rate, and lose the rental income you could have had if you bought today.